Add 1tsp salt and 1tsp red chili powder with shrimp and gently mix to coat well. Heat 2tbsp oil in a frying pan on high flame and add shrimp pieces and fry both side until little bit golden. Heat ghee and oil in a saucepan, add bay leaf, onion paste, ginger garlic paste, cumin and garam masala powder, paprika and sugar, stirring all the time and adding a little water to keep the spices from burning. Cook for 2min or until oil separates. Gradually stir in the coconut milk extract and a little salt. Add grinded fried onion paste and stir well. Now place the shrimp pieces into the gravy. Add green chilies, Cover and cook for 10 min on medium to low heat. Set aside. Heat ghee in a bowl; add green chilies, whole garam masala and fry little bit on high heat. Add rice and fry for another 2 min on high flame. Add 8 cup water into the rice and adjust salt. Add powder milk and keep stirring. Once the rice starts boiling, add the shrimp pieces with gravy and cook for 1 minute on high flame. Keep Stirring and mix well. After 20 minutes, open the lid and turn off the heat. 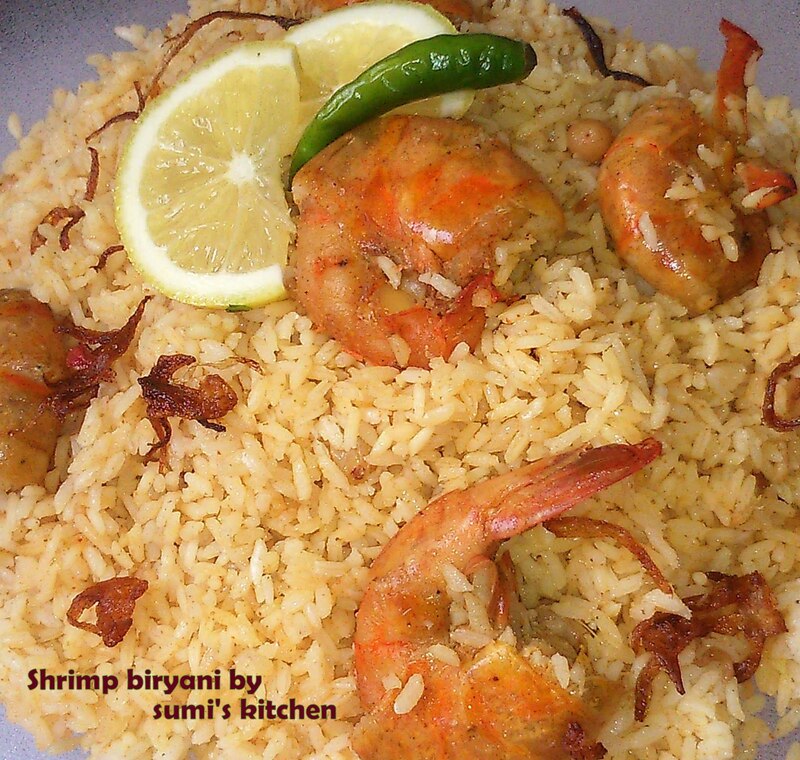 Sprinkle some ghee and fried onion and mix with the biryani.